Kirayaba! 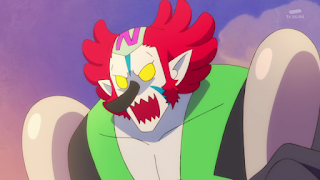 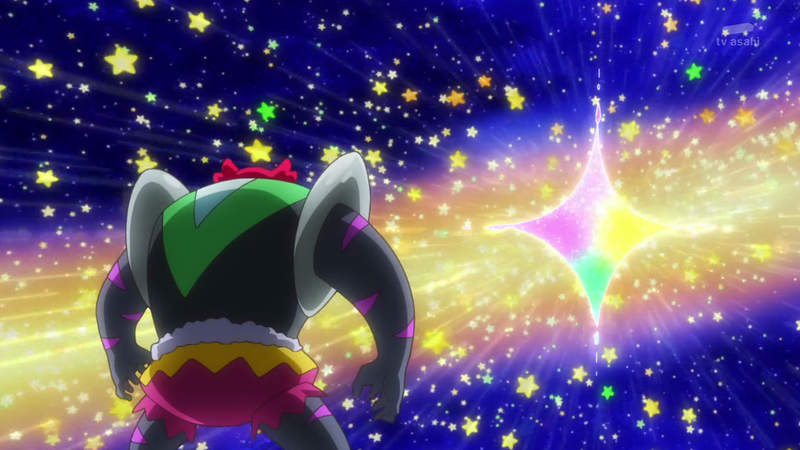 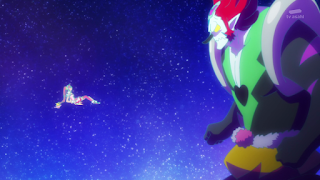 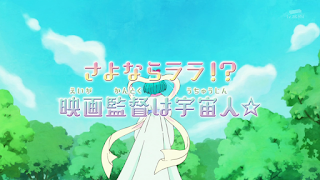 This is my review of Star Twinkle Precure Ep 11 and what happened after the girls' first major defeat? 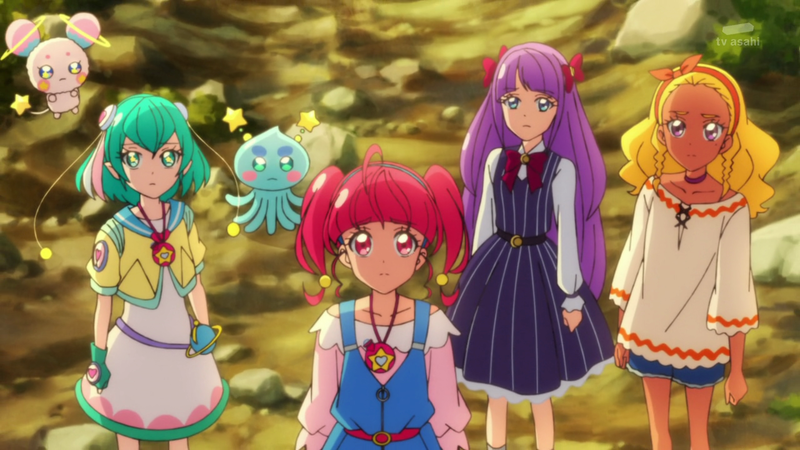 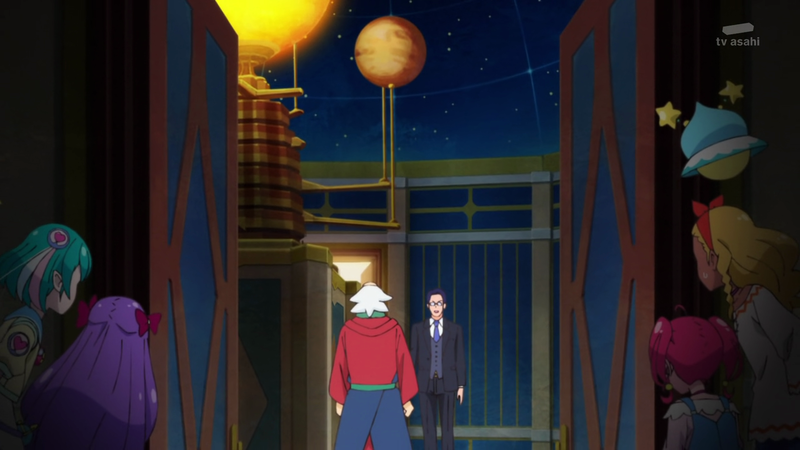 The girls arrived at Futarou's observatory and he was shocked to see Fuwa and Prunce. 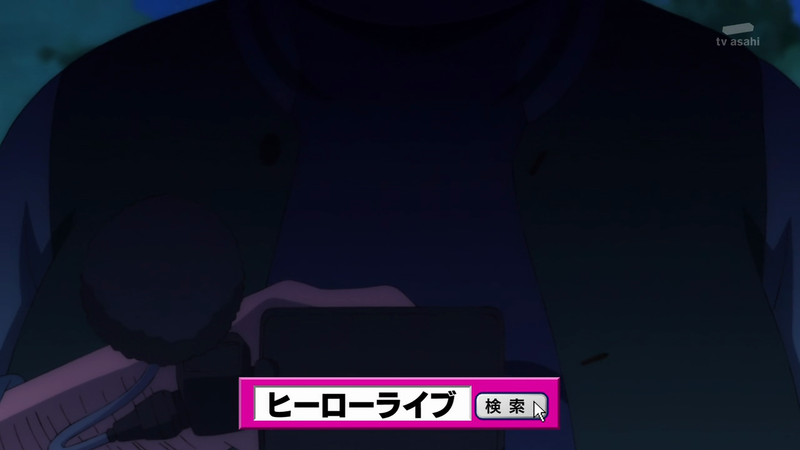 However Kaguya has arrived and the girls hide in the next room. Futarou played dumb and Kaguya was distracted by his men although he noticed the dirt on the floor. Futarou learn the true identifies of Lala and agreed to keep it a secret. This is where we see Hikaru all down inside the auditorium. Futarou explained that the Southern cross constellation is not just a guide for travellers but it also hold the endless possibilities for those who seek the unknown. 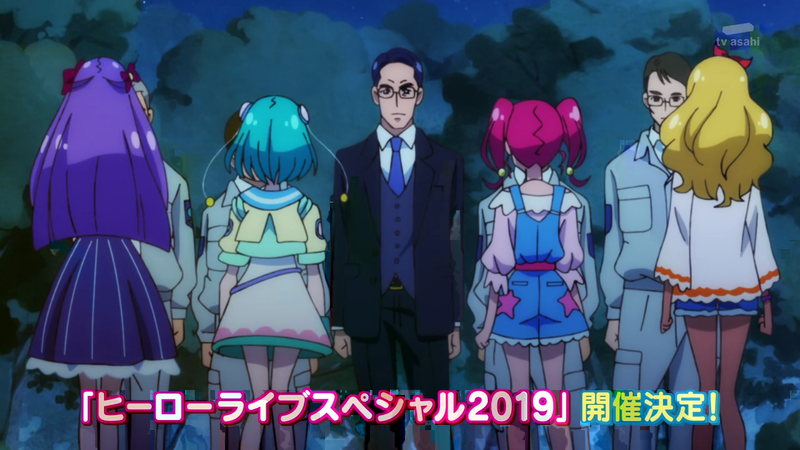 Meanwhile, the Knot Raiders has arrived on Earth and Aiwan suggested using the Taurus pen to make them become a Knot Trigger. 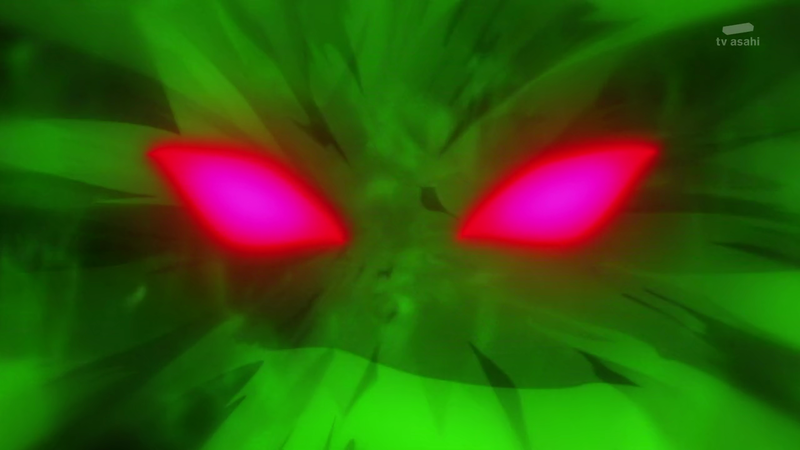 Bakanyan actually declined the offer which suggested two things-He is actually very strong and overwhelm the other three generals or he has a hidden secret that might be connected to the revival of the big bad-Darkest who is also awaken in this episode. 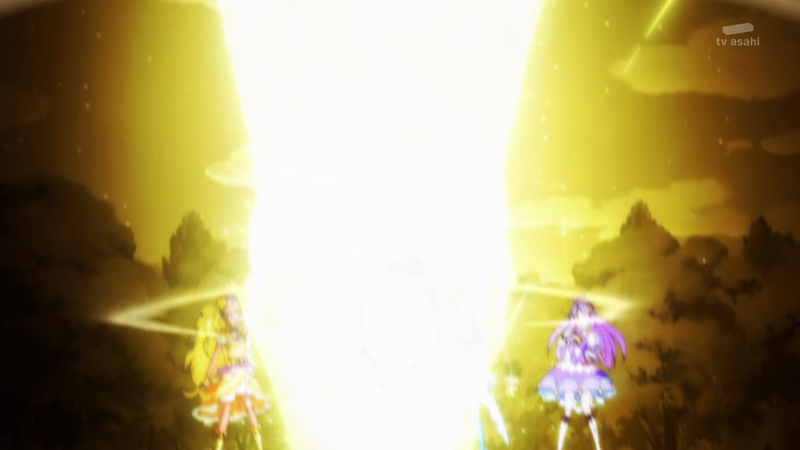 The Three generals become a Knot Trigger and Kaguya was knocked unconscious by it. The girls arrived to battle but were no match against the generals. 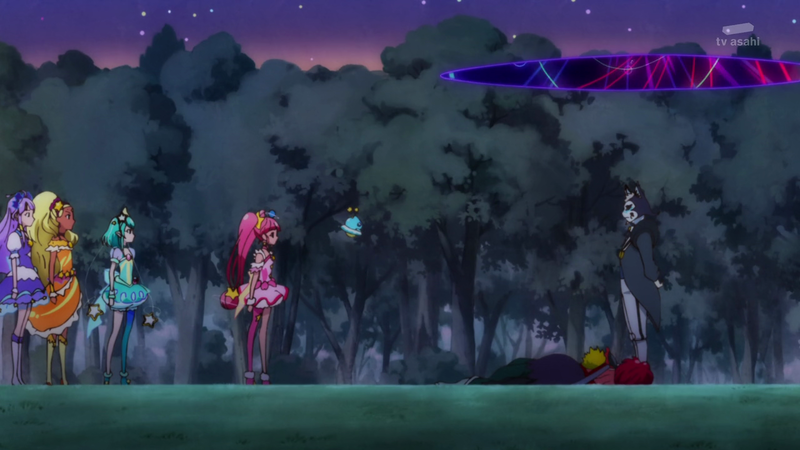 They even taunted Cure Star for being naive about the galaxy since the three generals has lost everything and has no choice but to serve Darkest. 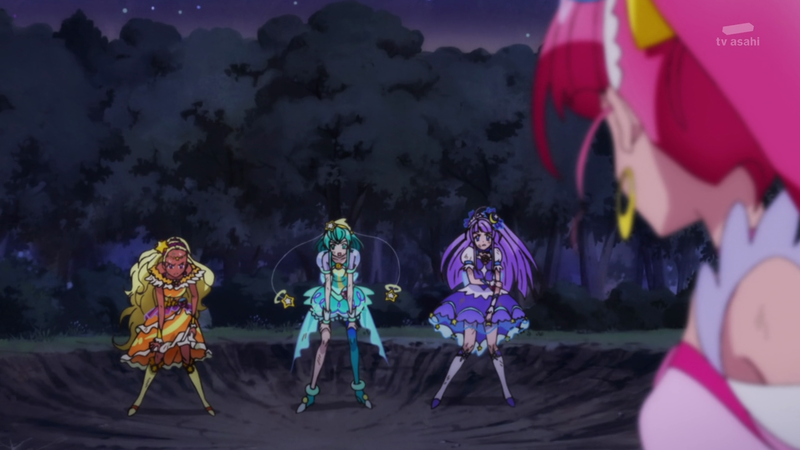 However the other three Cures told Cure Star that it was her and her "Imagination" that brought them together and learn the value of friendship. 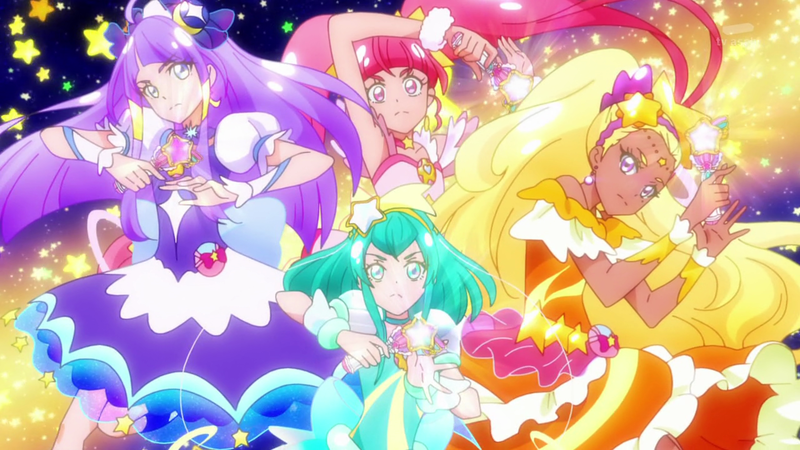 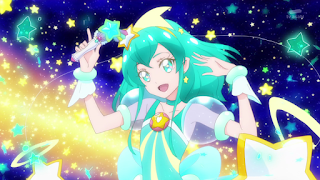 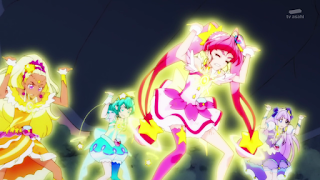 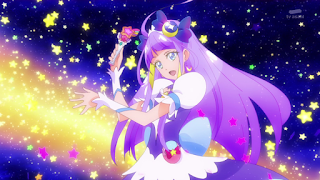 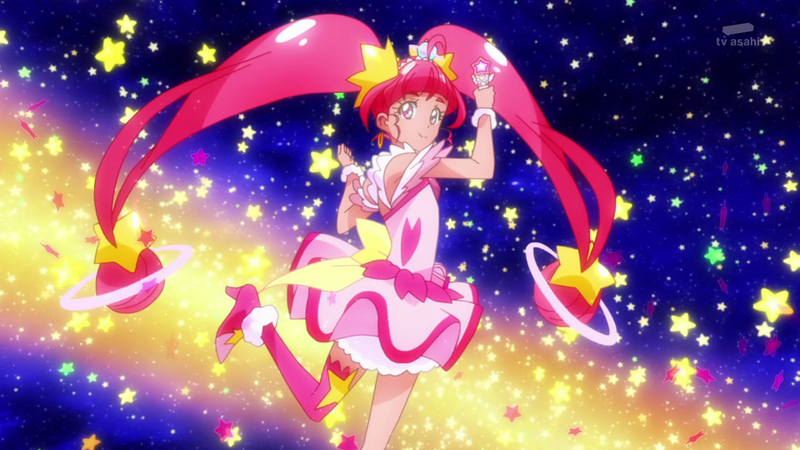 Cure Star joined with the others and their combined powers awaken their new power-Twinkle Stick and the Team Attack-Precure Southern Cross Shot which defeated the three generals. This episode is very personal to Hikaru as she learn about her mistakes and she nearly lose her "Imagination" since the three generals overwhelm them. 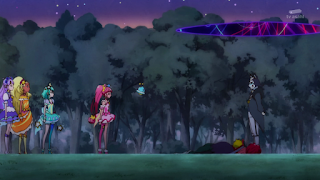 But thanks to her friends, (Which is a common trope in Precure) she believed in herself again and their bond actually create their new power up-the Twinkle Stick! 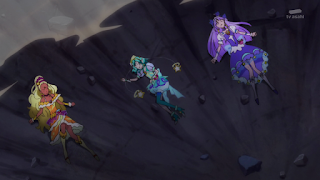 Similar to last season, we had yet to see how individual stick will work with each Cure but the team attack was pretty nice although I felt there was no finishing pose from the girls after the cleansing but it is still early since we have not even reach the middle of the season. As I said before, Bakenyan is now the most interesting character since he rarely take any action but he is the most calm and perhaps the most dangerous. (It is always the quiet ones you have to be careful) Furthermore, Darkest was awaken by Cure Star's new power and the idea of gathering the Princess Pen for the ultimate power is nothing special since it has been done to death by previous seasons. Overall, a great follow up from last week's episode but now who is this man with the camera that approached the girls? 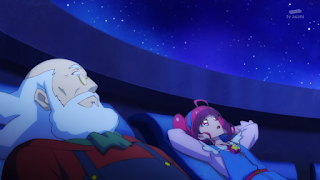 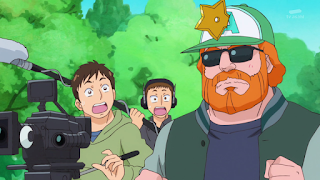 However the preview for next week episode spoil it as it is an Alien Film Director and he want Lala to be the lead for his next film! 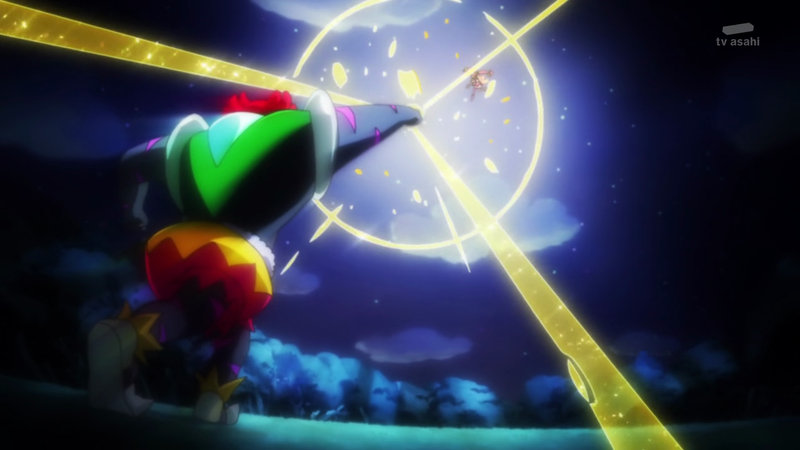 Until then, see you in the next post! 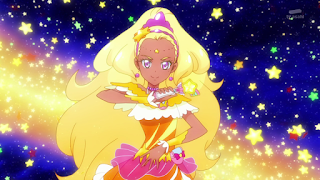 P.S: I will be in Japan from this Wednesday and be there for a week. 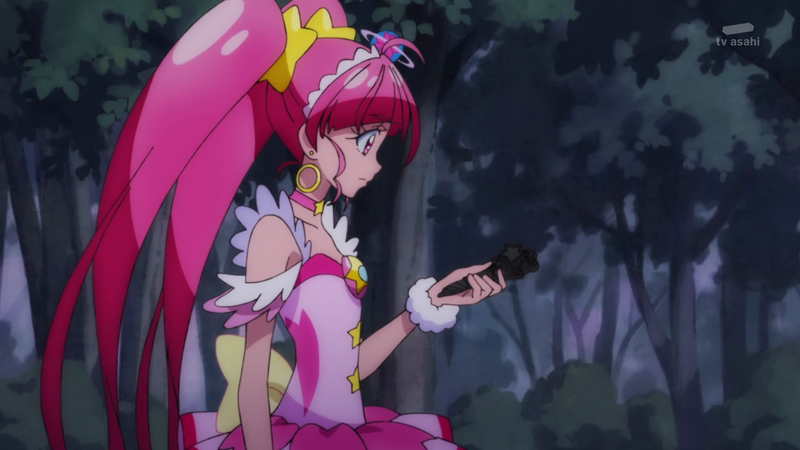 The next review will probably be posted after Episode 13 aired.